One of the most innovative branches is material engineering or material science. So it is astounding that constantly over time studies show that the majority of product innovations in material engineering are an economic failure in the market place, even if they have been technically advanced according to function and featured characteristics. Against it is shown that the success of material innovations can be increased through a collaboration between material producer and downstream player in the value chain. In order to do so, a framework to conceptualize technology-pull effect is developed based on insights from various disciplines like innovation management, marketing and consumer behaviour studies. 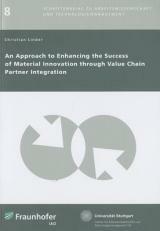 The outcome shows that a joint innovation strategy can be the key to reducing the failure rate of material innovations. Therewith this study contributes to innovation management research, as well as to practical management.